Barbra Streisand concert at Village Vanguard coming to DVD! 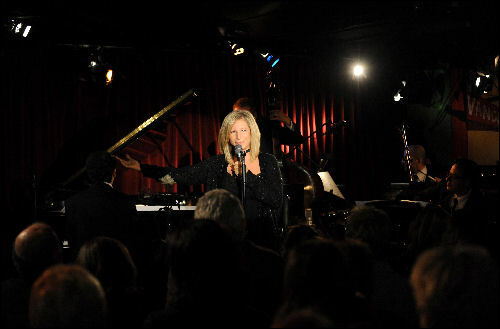 For one night only on September 26, 2009, Barbra Streisand performed an exclusive free concert at the legendary Village Vanguard in New York City where she last performed at in 1961, when she opened for Miles Davis. The concert was seen by Bill, Hillary and Chelsea Clinton, Sarah Jessica Parker, Nicole Kidman, and 100 fans who were lucky enough to win tickets. For those not lucky enough to score tickets can now watch her live performance on DVD or Blu-Ray when One Night Only – Barbra Streisand And Quartet At The Village Vanguard –September 26, 2009 hits stores on May 4, 2010 through Columbia Records. One Night Only – Barbra Streisand and Quartet at the Village Vanguard – September 26, 2009 is currently available for pre-order at BarbraStreisand.com.